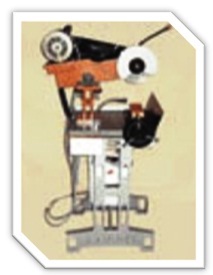 The Machine Base is mounted on a steel angle frame, the Cross-Slides to control the Horizontal and vertical movements of the work piece are made in Cast Iron. The Bearing Housing houses one end of the Rotating shaft, Step Pulleys and Belt. The other end of the shaft is connected to a bearing loaded revolving center. Main Shaft for holding Sawing Blades of up to 5- inch diameter. Shaft size is made as per the bore size of the cutting blades. The main shaft can take up to 60 Sawing Blades depending on the size of distance pieces required and the thickness of the cutting blades used. Coolant Pipes and Coolant splash-guards are provided. One 1.0 H.P. Motor, 1440 rpm, 220 volts-single-phase AC-50 cycle comes with the machine. 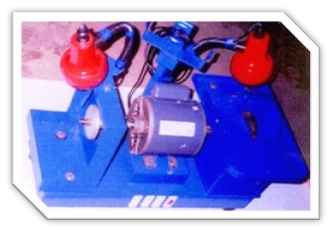 One Base plate, which can be rotated by 90 degrees, is provided with the machine for fixing of work pieces. The machine is supplied with one set of steel washers to support the cutting blades and the distance pieces. Rough Stones are fixed on to the base plate with the help of quick fixing adhesive glues or wax. The Base plate is attached to main machine. The main shaft is loaded with the required cutting blades separated by distance pieces of the required sizes. The main shaft is fixed to the revolving center. The motor and coolant pump are operated. The vertical and horizontal slides of the machine are set to just close to where the actual cutting will start. 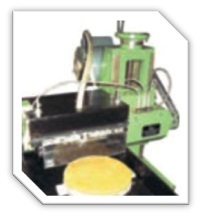 The horizontal slide is moved manually or through the attached tiny motor to achieve the horizontal cut. The base plate is rotated to 90 degrees. The horizontal slide is once again moved to achieve another horizontal cut. This results in small cubical sticks of the required size of the stone. These cubical sticks can be re-fixed to achieve one more cut, which will result in cubes being formed. These cubes can be further cut to get triangular shapes if required. Alternatively, the cubical strips can be taken on to a Single Blade Slicing Machine to cut them into the required cubes or triangles. production of synthetics or low priced stones. Spacers or distance pieces to be inserted between the cutting blades. These come in different sizes ranging from 2, 2.5, 3, 3.5, 4, 4.5 up to 8 mm. The Coolant pump and coolant tank should be arranged locally.